Recto (mount): separate label affixed to lower left corner, sideways to the left, imprinted in black ink, "74 Treasury Street, Canton, April, 1860." Recto (print): inscribed on negative at lower right corner, "C 74"
Recto (mount): lower right corner, sideways to the left, in pencil, "69" Verso (mount): lower right corner, sideways to the right, in pencil, "69 / EX.2000.1.69 [space] .63"
When Beato arrived in China, he began recording local life. 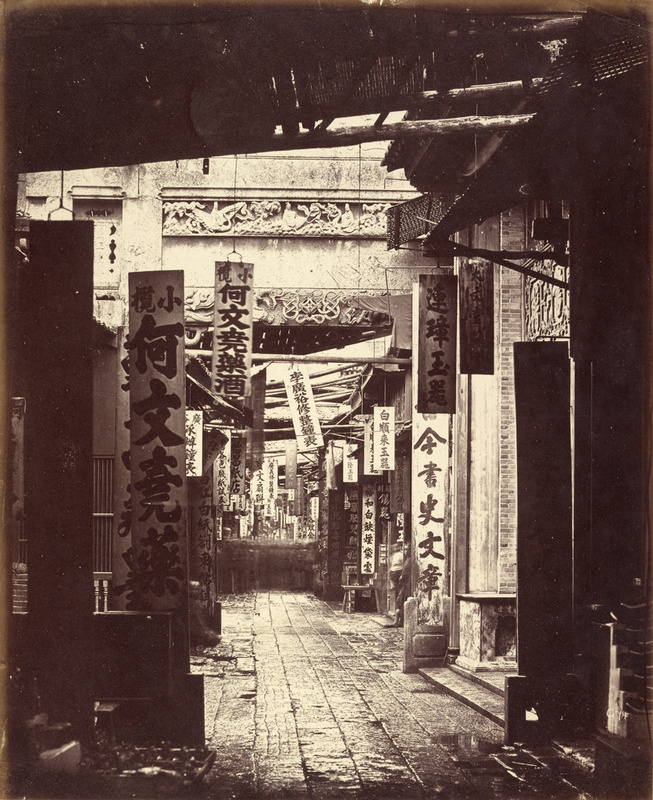 In April, while waiting for the British and French forces to prepare the upcoming offensive, he went to Canton (present-day Guangzhou) to photograph major monuments, such as the Nine-Storied Pagoda, an ancient Buddhist temple built in 537, as well as more vernacular subjects like the lively shops of Treasury Street.